According to research conducted by the American Cancer society, more than 36,000 cases of oral cancer are diagnosed each year in the U.S.A.. More than 8,000 of these cases result in the death of the patient. The good news is that oral cancer can easily be diagnosed with an annual oral cancer exam, and effectively treated when caught in its earliest stages, while at the later stages the 5 year survival rate is less than 50%. Early diagnosis is the key! Oral cancer is a pathologic process which begins with an asymptomatic stage during which the usual cancer signs may not be readily noticeable. This makes the oral cancer examinations performed by the dentist critically important. The most common type of oral cancer is the malignant squamous cell carcinoma. It is important to note that many oral cancers are linked with modifiable behaviors such as smoking, tobacco use and excessive alcohol consumption. White patches – This is a hardened white or gray, slightly raised lesion that can appear anywhere inside the mouth. Leukoplakia can be cancerous, or may become cancerous if treatment is not sought. If abnormalities, lesions, leukoplakia or lumps are apparent, the dentist will formulate a diagnostic impression and treatment plan. In the event that the initial treatment plan is ineffective over the course of a few weeks, a biopsy of the area will be performed. 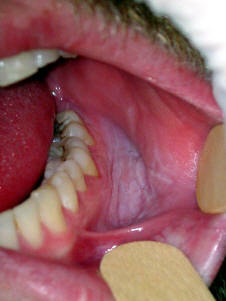 The biopsy includes a laboratory evaluation which will identify the precise type of the oral lesion. A new way to test for oral cancer before incisional biopsy is Oral CDX (brush cytology). The oral brush biopsy procedure is a simple office proceedure. It causes little or no pain or bleeding, and requires no topical or local anesthetic. Pressure with a circular brush is applied to the suspicious area. The brush is then rotated five to ten times, causing some pinpoint bleeding or light abrasion. The cellular material picked up by the brush is transferred to a glass slide, preserved, and dried. The slide is then mailed to a laboratory along with written documentation about the patient and a detailed description of the questionable area of the mouth. At the laboratory, they will examine the sample for cells which show signs of change, such as dysplasia or full malignancy. A pathologist examines the cells to determine the final diagnosis. A negative result of course, confirms that the cells are benign. In samples that are judged to be cancerous, either way a written pathologist's report are returned to the dentist. It is usually recommended that a positive result be followed with a conventional incisional biopsy. This is because the sample type taken by the brush technique does not provide the cells in any relationship to each other. In order to properly now determine the extent of the cancer, a sample which also provides the architecture, or the actual relationship of the different layers of cells to each other is necessary. The benefits of brush cytology are the possible avoidance of surgical biopsy, and the ease of sampling, which can be performed during a routine dental examination. Because of its ease of use, and the elimination of any surgical procedure, no matter how small, this method allows tissue samples to be taken early in the process of areas that in the past, the doctor may have decided to just watch for while. With oral cancer, an earlier determination is always important, for both your piece of mind, and because cancers caught earlier have a higher success rate of being cured. Oral cancer is deemed to be present when cellular abnormality is seen in the nuclei of cells on biopsy. Malignant types of cancer can readily spread to other places in the oral and maxillofacial regions, posing additional secondary threats. Treatment methods vary according to the precise diagnosis, but may include excision, radiation therapy and chemotherapy.